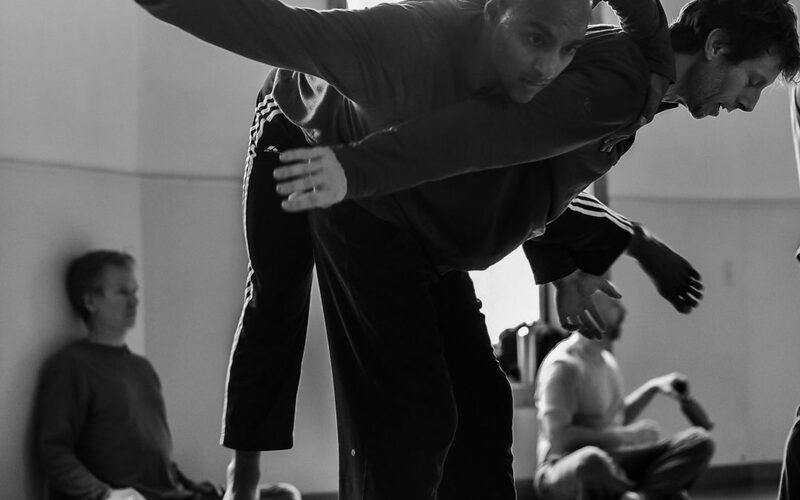 This workshop will spend time addressing what an advanced practice is and how it helps us move the form forward. As there will already a high level of skill sets in the room, I want to take time to move beyond teaching tricks and instead dive into the indescribable. We’ll spend some time warming up our solo dances – the only way to really understand a CI duet is when you really take the time to understand yourself first. The group will share the same physical grounding principles to get us all comfortable with sharing weight and taking risk together. Then I want to do research into redefining focus, confusion, and relationships. We’ll investigate shared synchronized narratives, as well as purposefully mismatching autonomies. There will be three long form sessions that re-emphasize the importance of observation and how we take that quality of observation from the perimeter to a closer orbit and then into touch. This all being said, we will: talk, work, pause, discuss, and do. We will think too much and then we’ll shut up and just dance. But throughout the weekend we’ll keep demanding that an advanced practice of CI, gained through observation and physical intention, can make us better people.